Mural painting is a public art often deals with difficult social, political and economic problems. However, in today’s generation, mural painting has become an integral part of the aesthetic, social and cultural statement. With that, still in celebration of its 50th Anniversary, Dole Philippines, Incorporated (or “Dolefil”) in partnership with the Norfolk Foundation, Inc./Dole Philippines School are partnering to offer an exciting opportunity to local artists – Mural Painting Contest. 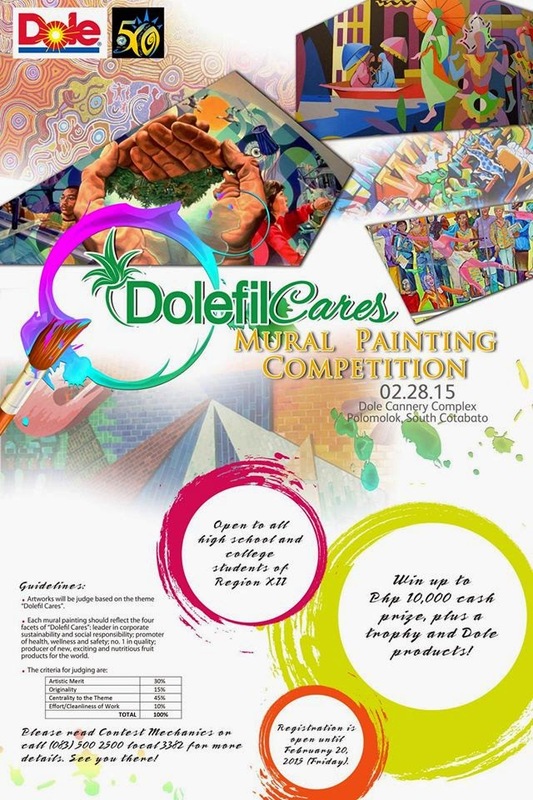 The Contest will be held in Dole Philippines, Inc. in Polomolok, South Cotabato on February 28, 2015 (Saturday) with the central theme, “Dolefil Cares”. See mechanics and eligibility to join after the jump. 1. The contest is open to all enrolled high school and college students of schools in Region XII. 3. There is no limit as to how many teams each SCHOOL / COLLEGE / UNIVERSITY will register; however, each team is allowed to submit only one (1) entry/design. Each group must be composed of three (3) members and only one (1) adviser (optional for college students’ category). 4. Actual participants will be pre-selected from the list of submitted entries and will be notified through letter, phone call or fax on or before February 24, 2015. 1. All participants will receive a Certificate of Appreciation and Dole products from the Contest Committee. 2. The winning school/college/university will get a plaque/trophy, cash prize and Dole products according to their ranking. 3. All winners will be announced on the day of the contest. Apart from the major awards to be given to the winning teams, Dolefil will be awarding the photo with the most number of accumulated likes and shares on Facebook as People’s Choice Award and will received Cash Prize and Club Kalsangi Gift Cheque.